"She pressed herself into him. She couldn't believe that she really had him, that he was really hers, that he really and truly loved her. She couldn't believe that she was going to lose him to darkness seeking darkness." Oh that's a goodie! Not the usual kind of book I'd read but that teaser has certainly captured me! Thanks for stopping by! this sounds quite good! Ooh that was a good one!! Haven't heard of this book but that was one helluva teaser! 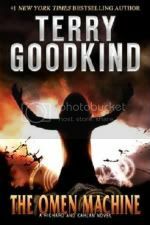 I really, really need to read some Terry Goodkind! thanks for the reminder! Oh wow! That is a tease! *flails* I saw this one at Hastings the other day and SO wanted it. Sadly, I was/am broke. GREAT teaser! Immediately makes me want the book even more.